Your first step in planning a destination wedding in St. Thomas should be contacting a wedding planner, resort or concierge on the island. Once you find a reliable wedding planner, make them aware of your budget and specific requests. Your budget should be determined by the number of guests you hope to have in attendance. As the planner scouts vendors and locations, ask as many questions as possible to ensure you get exactly what you are looking for. Later in the process, you will want to visit St. Thomas to make sure everything is going as planned and make any final event decisions. After determining the date and location of your destination wedding, you will want to notify your guests. It is best to inform your friends and family at least five to six months beforehand to ensure that lodging and airfare are properly arranged. As your wedding planner takes care of most of the on-site details, you will want to focus are arranging blocks of hotel rooms and discounted group airfare. The etiquette of destination weddings typically calls for invited guests to pay their own airfare, while the bride and groom cover the cost of the weekend. When arranging details with your guests, you may also want to determine what types of activities everyone would like to do outside of the ceremony. Then, your planner can help you construct an itinerary with everything from scuba diving to dancing. 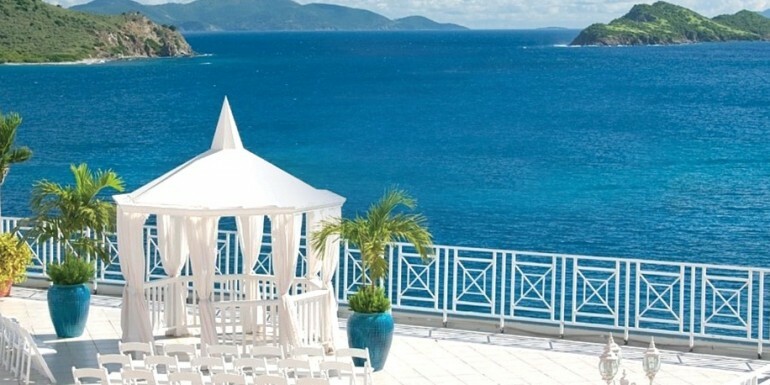 Also, consider having a wedding website where your guests can view updated details about your St. Thomas wedding. If you are working with a strict budget, shop around to find less expensive destinations and more inclusive wedding packages. You should also consider holding your ceremony in the tourism off-season and staging some of your events, like dinners and rehearsals, outside of high-priced tourist areas. Not only will this save some money, it will also allow you and your guests to experience your destination’s indigenous culture. Lastly, when getting married in St. Thomas or any other Caribbean location, you will need to obtain a local marriage license and a passport. The passport is now standard procedure for Caribbean travel; just make sure your guests are aware. Securing a marriage license can sometimes be more difficult. It is best to contact the local government and follow their instructions for permission. While your planner may be able to help with some of these details, some international locations require blood tests, immunization certificates or doctor’s certificates in order to legally marry. However, most Caribbean islands simply require a three-day residency prior to the ceremony, proof of citizenship, the completion of documentation and a small license fee. Your best sources of information on all these requirements are the U.S. State Department and the government office where your wedding is being held. After you add everything up, you will probably be surprised to find out that a luxurious destination wedding can actually be far less expensive than a traditional stateside wedding. Though you will have fewer guests, the all-inclusive packages mentioned here will allow your closest friends and family to spend an intimate weekend in a picturesque locale, all without breaking the bank.